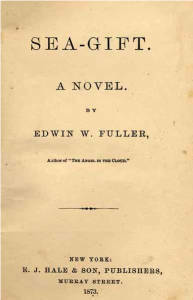 The most popular Chapel Hill writer after the Civil War was Edwin W. Fuller. He turned his student experiences into an autobiographical novel, Sea-Gift (published in 1873), which became known as “the freshman’s Bible.” The novel follows its central character, John Smith, from his enrollment at the university through his service in the Confederate army. Fuller’s realistic depictions of hazings, harassment of professors, and courtships appealed to many student readers. Sea-Gift also portrays its hero as an enthusiastic supporter of the war. Some critics have suggested that two elements of the novel, a long train ride to enter college and the burning of a plantation house by Yankee soldiers, may have influenced Thomas Wolfe’s Look Homeward, Angel and Margaret Mitchell’s Gone with the Wind.